Nike Air Force 1's are like the Lamborghini's of sneakers – everybody wants them, everybody wants to be seen in them. But what if your car had a set of Air Force 1's, too? As part of New York Fashion Week, the 2019 Lexus UX crossover comes fitted with a set of retro Nike-inspired white tires. The project is a collaboration between fashion guru John Elliott and Lexus – the company calls it the "Sole of the UX." Punny. 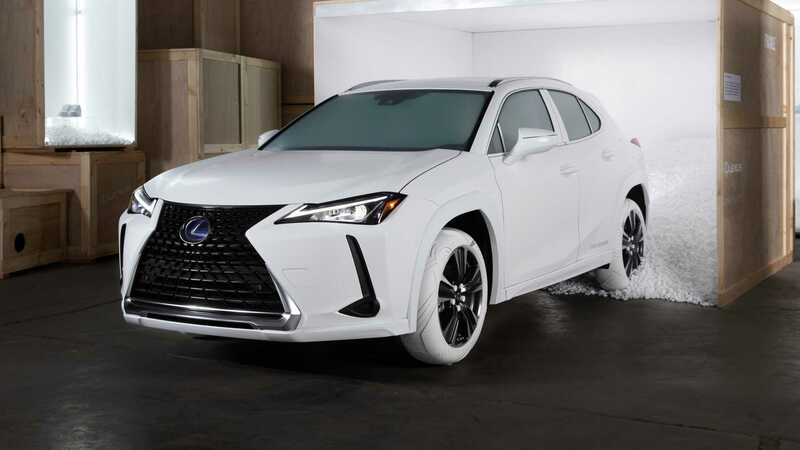 The white tires share recognizable traits like the iconic Nike swoosh, faux white pebbled leather, and matching embossed detail with the iconic Air Force 1 sneaker, all wrapped around a set of 18-inch Lexus UX wheels. As part of the one-off tire debut, artists Hassan Rahim, Matt McCormick, and Yung Jake used a pair of John Elliott and Nike AF1 shoes as their canvases. Each artist created custom works of art and auctioned them off to charity. The proceeds from each set benefit Inner-City Arts, an organization based in downtown Los Angeles, whose mission is to provide access to arts eduction to underprivileged youth. This isn't the first time we've seen an automaker partner with a clothing brand, though. In 2013, Fiat and Gucci created the custom Gucci Edition 500 hatchback. And just last year, McLaren teamed up with iconic British brand, Belstaff, for a new line of fashion accessories. Lexus hasn't committed to selling its one-off Jordan tires – but there are probably some fashion-forward owners out there looking to take these home.